Tate Liverpool is housed in a converted warehouse at Albert Dock and is one of the UK’s largest galleries of modern art outside London. It is one of four Tates nationwide that display work from the Tate Collection, the others being the Tate Modern and Tate Britain in London, and the Tate St Ives in Cornwall. Special exhibitions in 2012 include Charline von Heyl, Martin Creed, and Turner Monet Twombly. Major exhibitions in recent years have included Rene Magritte, Klimt, Picasso and Matisse. Entry to Tate Liverpool is free, except for the special exhibitions. The gallery is open 7 days a week throughout the year, and only closes on Good Friday, Christmas Eve, Christmas Day, and Boxing Day. Opening times are 10 am to 5.50 pm. Facilities include an information desk, toilets and baby changing areas, a cloakroom, and a shop selling books, catalogues, gifts and souvenirs. Tate Liverpool also offers a café serving breakfast, lunch, and afternoon tea. Tate Liverpool is situated at Albert Dock. Other attractions here include the Merseyside Maritime Museum and International Slavery Museum, the Beatles Story, and the Yellow Duckmarine. Liverpool One, the Echo Arena, and Pier Head are within easy walking distance. Tate Liverpool is a 20 minute walk from Liverpool Lime Street, the closest mainline train station, but it’s possible to transfer to the Merseyrail network there and Wirral Line service to James Street station, around ½ mile from the gallery. Albert Dock is well signposted from the M62 motorway. There is limited pay-and-display car parking at the dock itself. More parking spaces are available at Liverpool One (3 car parks) and the Echo Arena. Map showing location of Tate Liverpool. 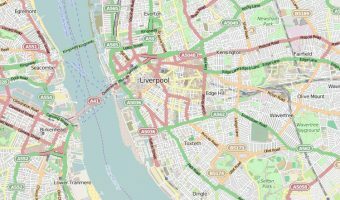 Interactive map of Liverpool. Includes hotels, tourist attractions, transport links, shopping centres, and more. 5-day weather forecast for Liverpool. View temperature, wind speed and chance of rain.